A friendly reliable service that does the running for you! Kimmel Corporation understands that your time is precious to you. That’s why we want to offer you a Pick-Up and Delivery Service that can free up your valuable time. 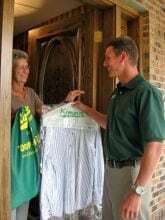 We can do this by picking up and delivering professionally handled dry cleaning and laundry right to your door at your home or office. We have made it easy for you to use our Pick-Up and Delivery Service! 2. Place your clothes in the Kimmel bag provided. 3. Leave your bag out on your scheduled Pick-Up and Delivery day. 4. On your next scheduled day bring in your clean professionally finished clothes! No missing buttons, attention to detail to collars and cuffs and finishing preferences to the starch you request. We use state-of-the-art processes that gently clean your entire wardrobe, from your finest fashions and business attire to casual wear. We repair and re-size woman’s apparel, men’s wear, and children’s clothing. We also provide hems and repair zippers. Earn points toward $10.00 in free cleaning every time you bring in your cleaning. Twenty points equals $10.00 off your next incoming order. This includes UGG boots, Coach purses and all other fine quality leather and suede. The staff at the Kimmel Corporation has the equipment and knowledge to reverse smoke damage to garments. We specialize in restoring antique gowns and use special packaging to preserve your family heirlooms for generations to come. We are the experts in alterations, cleaning and preservation! We personally inspect and treat all our gowns at our facility. Our gowns are never sent away to “big box” processing facilities to be processed. The experts at the Kimmel Corporation use a cleaning system that is commonly referred to as steam cleaning. The process consists of spraying a solution of water and detergent into the pile and recovering the water and soil with a powerful vacuum system. A protective fiber coating is also available for all area rugs. The Kimmel Corporation will pick up and deliver any large area rugs on request at your home or business. Indoor pollutants such as dust, smoke, cooking odors and insects can damage your treatments over time. The Kimmel Corporation offers our customers two convenient options for cleaning window treatments. You can bring your draperies to us or we can come to you. Best of all, with our “take down re-hang service” you do nothing at all. We will come to your home take down your draperies then clean, finish and re-hang them at your convenience. The Kimmel Corporation offers professional cleaning with expert knowledge and care you can trust. Before cleaning, all upholstery is carefully inspected for the best cleaning method suitable for the material type and degree of soiling. Kimmel’s also offers a stain protective coating that will protect against any future stains. We also clean and deodorize patio furniture cushions. Pet urine is a “smelly problem” when it absorbs into your carpets or upholstered furniture. And most pets will “re-visit” an untreated area again and again. It is important to remove these stains as soon as possible, because as time goes by they are harder to remove. The Kimmel Corporation has experience in treating odors associated with pet stains. We use a professional enzyme digestor that will dissolve these odor causing elements and leave your upholstery with a fresh clean look and smell.